Keeper,” the late Larry Gibson. peaceful, non-violent resistance to mountaintop removal. the local West Virginia communities impacted by mountaintop removal. training, listening projects and other activities. your own transportation and car-pooling is encouraged. Sunday we will visit Kayford Mountain. Three weeks after the Fall Summit, check out Hands Off Appalachia’s Fall Action Camp in Connecticut [UBS America’s Headquarters] November 19-25. The camp will build organizing capacity and leadership skills among anti-extraction activists in the northeast. After all the hard work and learning, we’ll put our new skills into practice with a culminating action! Hands off Appalachia is an urban-based campaign that targets the funding of mountaintop removal. Four RAMPS and Mountain Justice folks took a plea deal today from the May 24 blockade of Alpha Natural Resources/Massey’s headquarters near Bristol, Tenn. A video from the action is here. Emily Gillespie, Junior Walk, Jocelyn Sawyer and Andy pleaded to blocking a roadway in exchange for the prosecutor dropping obstruction of justice. Each was sentenced to five days in jail plus a $100 fine and $116 in court costs. Additionally, the entire group was ordered to pay $3,328.77 in restitution to the city of Bristol. Plea deal, dropped one charge and pleaded to obstruction of a public road or something like that. Obstruction of justice was dropped. Plea agreement was 5 days in jail (10 days, but way this jail is you only do half-sentence if on good behavior). Restitution to Bristol is $3,328.77, from the group as a whole. Each of them have $100 fine plus $116 court costs. More information will be out soon so check back over the next day or so. 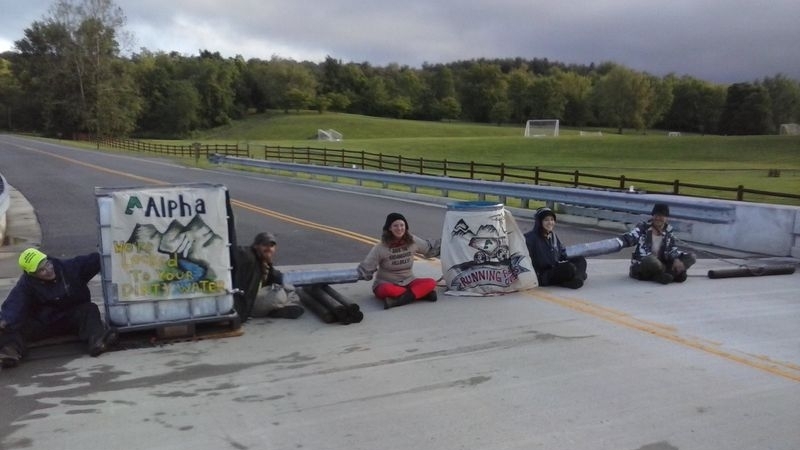 This action happened earlier in the same day as a Hands Off Appalachia action that targeted UBS Wealth Management, a large financier of strip mining. This Mountain Justice post summarized the events of the day. Appalachia Rocks the House in Knoxville and Bristol Today; 7 of 8 Arrested Released! investment. That capital comes at the cost of the people of Appalachia. blocking a roadway and obstruction of justice. equipment to dismantle the protest. All three were charged with criminal trespass and resisting arrest and were released by late Friday afternoon on $500. Click here to donate to the Mountain Justice Legal Defense Fund. UBS Wealth Management targeted by nonviolent protest. This morning, activists associated with Mountain Justice, Radical Action for Mountain Peoples’ Survival (RAMPS), and Hands Off Appalachia! entered the Gay Street branch of UBS wealth management services and refused to leave. Inside the office, three activists locked themselves to a large paper mache puppet depicting an investment banker. The non-violent protest was in opposition to UBS’ funding and supporting of the harmful extractive process known as mountaintop removal coal mining. “Mountaintop removal coal mining requires intensive injections of capital investment. That capital comes at the cost of the people of Appalachia. I’ve engaged in this non-violent act of protest against UBS’ funding of mountaintop removal to exhibit our dedication to ending their funding and support of an industry that is devastating Appalachia and killing it’s residents.” — Ricki Draper, Hands Off Appalachia! And Knoxville Resident. UBS provides funding and investment services to Patriot, Arch and James River Coal Companies. Those three companies, operate active strip mines in Kentucky, Virginia and West Virginia. “I’m sick and tired of seeing my home get blown up for corporate greed – and UBS is bankrolling the blasting of my community. UBS, listen up: My family’s not a profit margin, our mountains aren’t collateral damage, and we want you out of here: Get your hands off of Appalachia,” said West Virginia resident Junior Walk. Junior Walk was part of protest today targeting Alpha Natural Resources. Walk and several others [confronted] Alpha at their headquarters in Bristol, VA. UBS acted as the financial advisor for Alpha Natural Resources’ acquisition of Massey Energy in 2010, which created the largest mountaintop removal company in the world. Mountaintop removal coal mining (MTR) is a form of strip mining that was developed in the 1970’s as a method for extracting coal cheaply. Companies use explosives to remove the top layers of soil and rock from a mountain ridge, exposing the seams of coal for easy access. The valley-fills that accompany mountaintop removal are poisoning water supplies, causing cancer and birth defects, devastating local economies, and displacing large segments of Central Appalachian residents. Hands Off Appalachia! (HOA!) is a Knoxville-based campaign demanding UBS change their official policy and stop funding and supporting companies that engage in mountaintop removal coal mining. Mountain Justice seeks an abolition of MTR and the protection of the cultural and natural heritage of the Appalachian coal fields. This work is done through grassroots organizing, public education, nonviolent civil disobedience and other forms of citizen action. leave,” Junior Walk, 23, from the Brushy Fork area said. reason for these community health emergency levels of health impacts. The impoundment at Brushy Fork holds back almost 5 billion gallons of toxic sludge and isconsidered the largest earthen dam in the Western hemisphere. Recently leaked records show that coal slurry impoundments in Appalachia failed 59 out of 73 total structural tests performed by the Office of Surface Mining. “Alpha is only profitable because they’re allowed to gamble with our lives—and we’re the ones who pay the cost of their negligence and toxic pollution,” Walk said. continue to violate safety regulations and expand their hazardous operations. destructive mountaintop removal mining practices, Alpha continues to push forward similar projects, such as the controversial Coalfields Expressway in Virginia. Click the poster image to load the full-size version. Download the quarter-sheets here. Join Mountain Justice this May 19th – 27th for our 9th Mountain Justice Summer Action Training Camp, near Damascus, VA. Mountain Justice has grown from a fast burning brush fire that helped push Mountaintop Removal to national awareness into a critical support network at the base of a growing, national anti-extractive industry movement for social and environmental justice. This year, it’s time to fan the flames of resistance to dirty energy, and put an end to MTR once and for all, while continuing to support bottom up economic transition for a brighter Appalachia. Will you join us as we build pressure and momentum to stop strip mining and other destructive extractive industries in Appalachia! Mountain Justice Summer Camp is a place to learn skills, expand on the ones you already have, strengthen connections in networked social movements for Justice, meet new allies and take action to stop the destruction of Appalachia. Workshops will range from mountaintop removal 101, and non-violent civil disobedience, to campaign and community organizing, science and SMCRA (Surface Mine Control and Reclamation Act) and Appalachian Community Economics. In addition we’re including a more in depth training for trainers track to help build our collective skills as trainers. 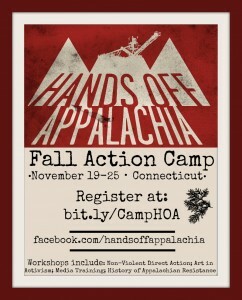 Expect direct action to be part of this camp, though participation is not required for camp attendance. Mountain Justice welcomes parents, kids, families and people at all ages and stages of life. For several years MJ events have included a physical space and a crew of people we call the Kid Collective to offer loving and experience child care givers and educators, armed with books, crafts, toys games and quiet space. Please think about bringing your little ones. Contact erin (at) mountainjustice (dot) org if you plan to bring kids, so we can get all the necessary details. The final schedule will be released later, but you can register now here. To be notified for updates on camp schedule and other MJ events, sign up for our news and announcement list. Registration fees are on a sliding scale based on your ability to pay, and no one will be turned away for lack of funds. We do provide 3 meals a day, a place to sleep, and amazing trainers from across our region, so we ask for donations between $15 and $50 per day, or $150 – $500 for the duration of camp. Starting Jan. 7 in St. Louis, MO. 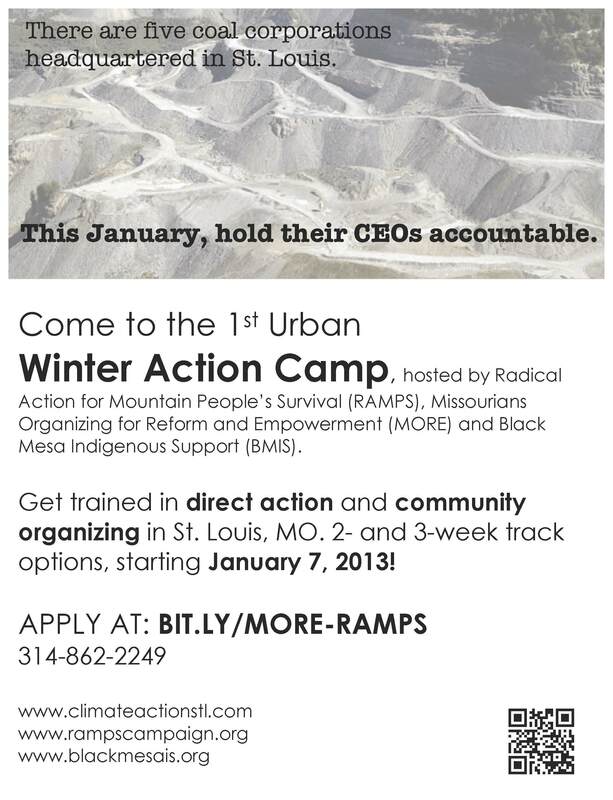 Organized by Radical Action for Mountain Peoples’ Survival (RAMPS) and Missourians Organizing for Reform and Empowerment (MORE), Black Mesa Indigenous Support (BMIS) and members of the Black Mesa/Big Mountain Communities. Apply here today, space is limited! Not able to come? How about supporting the camp through a donation! West Virginia will have travel expenses. growing national uprising against economic and resource extraction. St.
Peabody, Arch and Patriot, as well as industrial agri-giant Monsanto. We can’t wait to have you join us, learn new skills, and build the movement! Apply here today, space is limited! tolerate harassment of any kind. There is limited space so apply early! If you have any questions, feel free to contact [email protected]. Come to the beautiful mountains of West Virginia for your Spring Break! Learn about and take action against the destructive effects of the dirty life-cycles of coal and natural gas! Stand in solidarity with the communities in Virginia, West Virginia and southwest Pennsylvania facing the ongoing destruction of coal mining and hydraulic fracturing! See mountaintop removal coal mining and hydraulic fracturing natural gas extraction up close! Take direct action against the dirty coal industry! This March, Mountain Justice Spring Break (MJSB) will bring together coalfield residents, college students, environmentalists and concerned citizens who are interested in learning more about mountaintop removal coal mining and hydro fracking. March 2-10, MJSB will be in the town of Appalachia, Virginia, in an area that has been heavily impacted by mountaintop removal mining. March 10-17, 2013 MJSB will be in central West Virginia close to fracking sites. We will spend a week cultivating the skills and visions needed to build a sustainable energy future in Appalachia. Through education, community service, speakers, hiking, music, poetry, direct action and more, you will learn from and stand with Appalachian communities in the struggle to maintain our land and culture. Mountain Justice Spring Break will also offer a variety of community service projects. Mountain Justice Spring Break in Virginia will be held at the Community Center in the historic mining town of Appalachia. Nearby Black Mountain is being blasted right now by coal companies and you will see the effects on the forests, water, land and people. Coal trains rumble through this small community, which was once a thriving mining town. MJSB in West Virginia will be held at a lodge in a county park surrounded by wooded hills and a pretty West Virginia mountain creek, and lots of fracking for natural gas. The Doddridge County Park is easy to find and convenient to Interstates 77 and 79 and US 50. For more information or to register for Mountain Justice Spring Break in Virginia, go here. For more information about MJSB in West Virginia, go here. Come to Mountain Justice Spring Break and support grassroots, community led resistance to environmental injustice!